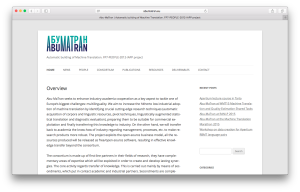 Abu-MaTran seeks to enhance industry-academia cooperation as a key aspect to tackle one of Europe’s biggest challenges: multilingualism. We aim to increase the hitherto low industrial adoption of machine translation by identifying crucial cutting-edge research techniques, preparing them to be suitable for commercial exploitation and finally transferring this knowledge to industry. On the other hand, we will transfer back to academia the know-how of industry regarding management, processes, etc. to make research products more robust. The project exploits the open-source business model, all the resources produced will be released as free/open-source software, resulting in effective knowledge transfer beyond the consortium. The core activity regards transfer of knowledge. This is carried out mainly by means of secondments, which put in contact academic and industrial partners. Secondments are complemented by recruited staff, which will be in charge of gathering the knowledge transfer and implementing it at the hosts in the longer term. We work on a case study of strategic interest for Europe; we provide machine translation for the language of a new member state (Croatian) and then extend to related languages of candidate member states. The project has a strong emphasis on dissemination, through the organisation of workshops that focus on intersectoral knowledge transfer. Finally, we have a comprehensive outreach plan, including the establishment of a national Linguistic Olympiad, open-day activities for students and the participation in Google Summer of Code. For more information please visit http://www.abumatran.eu. The project has received funding from the European Union’s FP7-PEOPLE programme under grant agreement no. 324414.